With so many clear sightings of the Galaxy Folder 2, you may be forgiven for assuming that Samsung's upcoming clamshell had already released. As yet, the sequel to the original Galaxy Folder has not even been announced. Still, whether you're waiting on its release or would just like another look at this rarest of beasts, a full leak of an unboxing is now upon us. A true aesthetic throwback, the flip phone design is quite an eyebrow raiser in today's world. Though it has many very obvious disadvantages versus the form factors of the iPhones, HTCs and Samsung very own Galaxies, we'd hazard that there are benefits to be had. Indeed, while modern-era smartphones have solved many problems of the dumbphone era, they cannot replicate the feeling of slamming a phone shut to abruptly end a call. It was just too gratifying. Where older devices could muster calls, SMS — and if you were lucky, a few games — Android 6.0 Marshmallow furnishes the Galaxy Folder 2 with one or two additional extras. On the hardware front, the device gets a 3.8-inch, 480 x 800 display, Qualcomm's 1.4 GHz Snapdragon 425, a couple of gigs of RAM and 16 GB of expandable storage. Elsewhere, there's an 8-megapixel main camera, a 5-megapixel effort for selfies and a 2000 mAh battery. The unboxing leaks appear to have originated from the same source as the one we showed you earlier, though the leaker seems to have been more liberal with the photos this time around. In the gallery below, you'll get to see the device from all angles as well as inside. There's also peek at the headphones bundled with the Folder 2, and a few side-by-sides with what we believe to be the LG Wine Smart. It remains to be seen when the enigmatic handset will launch, though it's likely that the Galaxy Note 7's is affecting Samsung's other roll-outs. With the company amid a worldwide recall, it could still be a while before the Folder 2 gets its official stamp of approval. 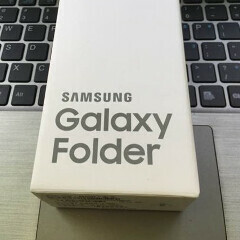 We'll let you know as and when the Galaxy Folder 2 hits the scene and in the meantime, take a peek at the unboxing below. yeah yeah yeah..we get it. It was funny at first but you guys ran the joke into the ground really quickly. Off topic... thought the LG V20 announcement is today? How come no articles or blog? Off-Topic but if you're a TracFone user, or any user of the American Movil networks it looks like ZTE might be releasing an Android Flip Phone in the united states. Quite possibly, an exclusive to these networks until dictated otherwise. ZTE Z353VL. Be so glad when the 3 year old Ibore phone is presented tomorrow and then forgotten about so we can move on to regular good articles about other phones that actually innovate instead of copying and repackaging other manufacture's ideas. Samsung surely went directly at LG with this phone and it looks better too.